Designed by architect David Bryce, the Royal Infirmary at Lauriston Place was a state-of-the-art hospital when it was opened in 1879. The main hospital was also complimented by the new Edinburgh Royal Maternity Hospital. In its day the Royal Infirmary was probably the best-planned hospitals in Britain. However, by the second half of the twentieth century it was proving inadequate to the needs of the new National Health Service. It was moved to a new site at Little France on the south-eastern outskirts of the city in 2003. Most of the site has since been redeveloped as the Quartermile project. 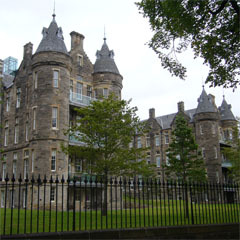 It is also home to the University of Edinburgh’s Futures Institute.